Cleveland has some pretty exciting things happening this year. One of the most energetic is the Dazzle the District celebration on May 2. Playhouse Square is making history and changing the face of downtown with significant neighborhood renovations. There will be dramatic new lights and video signage around PlayhouseSquare, elegant gateways, a "retro" sign inspired by PlayhouseSquare's 1920 roots and the world's largest outdoor chandelier - the GE Chandelier. This is going to be an unveiling that will go down in history. It will be one of those events that you will kick yourself if you miss. Check out this video about the GE Chandelier. It is pretty cool. Keep in mind if you are going, bags and backpacks are not permitted. Small purses and diaper bags are allowed, but they will be subject to search. Plan ahead. If you are going to the event, make sure your phone is charged and tweet away using the hashtags #DazzleCLE and #ThisisCLE. Make your friends jealous. Now for the fun part! Want to win a bag of Dazzle swag from PlayhouseSquare? There are a couple of ways to enter to win, so make sure you leave a separate comment for each method of entry. I let a computer pick the winner, so if you don't comment, you lose an entry. Big ol bummer for you if you don't follow directions. 1. Leave a comment telling me your favorite thing/memory about PlayhouseSquare. 2. 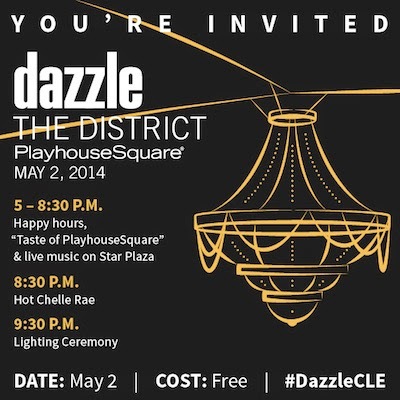 Tweet the following: " I can't wait for May 2 to #DazzleCLE with @playhousesquare and @clevelandchick http://bit.ly/1hE0MMP! 3. Follow @playhousesquare and @clevelandchick on the Twitter. You have until Thursday, May 1 at 4 pm to enter. Start tweeting! Disclosure: The good folks at PlayhouseSquare asked me to share with you information about this dazzletastic event. They offered a swag bag for me and one for me to giveaway to one of you spectacular readers. Today, i took my 16 yr old to see American Idiot for his birthday. What a great memory! My favorite memory was when my then boyfriend (now husband) took me to see Mary Poppins for my birthday. He had never been to the theater but made what he thought was a sacrifice for me. Imagine my surprise when we were seated in the front row! WOW! What a great show. Needless to say, he still goes to theater with me regularly! I have seen so many great shows at the Playhouse including Stomp, Phantom, Beauty and the Beast and Fiddler on the Roof! I also love the performances they put on for the schools! Junie B Jones was one of my kids favorites but they enjoy them all! The District is looking so good! I can't wait until it's all done and ready to dazzle! I follow both on Twitter as @Tribechic! I saw Leonard Cohen at the Allen theater at Playhouse Square in 2008. It was the best! I would follow you on twitter, but they cap followers and I can not follow more people. I want to make memories! My last memory is of Lion King. I was excited to go but unexpected conflict came up. I was disappointed but donated the tickets to the Ronald McDonald House. Received a really great thank you note. Thanks for commenting. Winner will be selected this evening.